Since 1995, Operation Inasmuch has impacted Fayetteville & Cumberland County, North Carolina, through a bi-annual, hands-on volunteer Blitz Day. Area churches joined together, serving the community in the name of Christ. In January 2007, we opened our doors as a 501 (c)(3) nonprofit. Again, we felt God’s call to compassionate ministry and our vision multiplied. Our journey through the years has been exciting …although God’s plan for Operation Inasmuch is more than we can ever imagine! We pray you will join us. Here are some of the major projects we’ve accomplished over the past 11 years! Inasmuch began to rescue this historic downtown neighborhood eleven years ago. 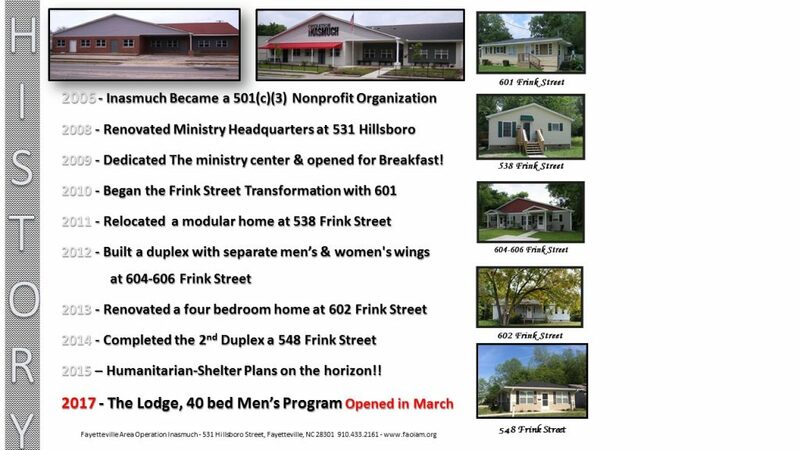 To date, we have renovated our 8,000 square foot ministry center, built or rehabbed five homes, renovated 2 duplexes, and built the Lodge.